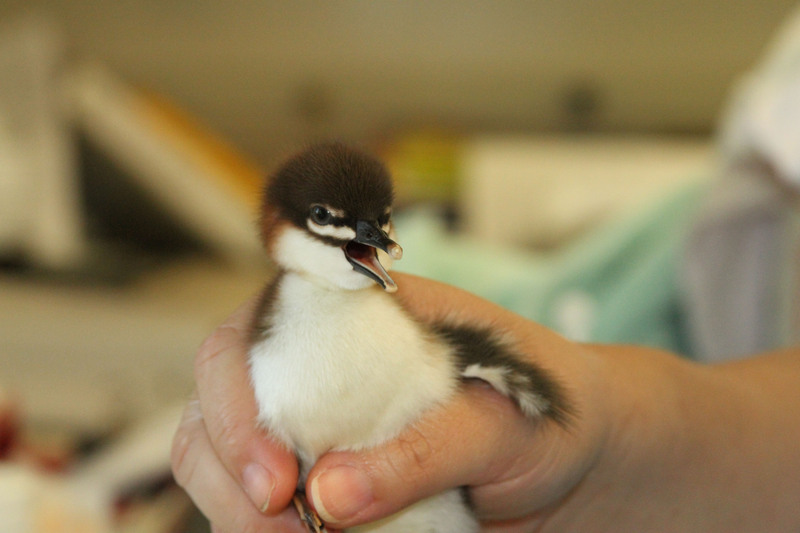 Join us in our “Every Bird Matters” Spring Membership Drive! 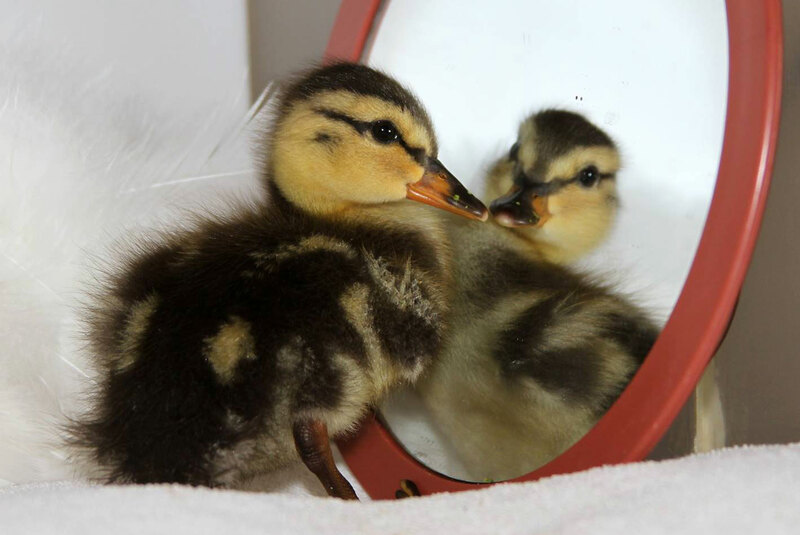 Our first baby ducking showed up this week, signaling the start of beautiful and busy spring. 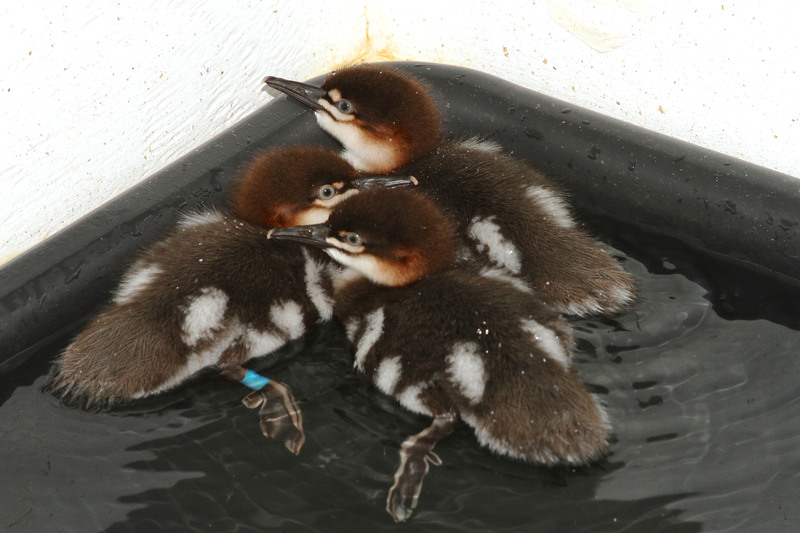 It’s already been a busy winter and we cared for hundreds of seabirds affected by the “mystery goo” event in San Francisco Bay. 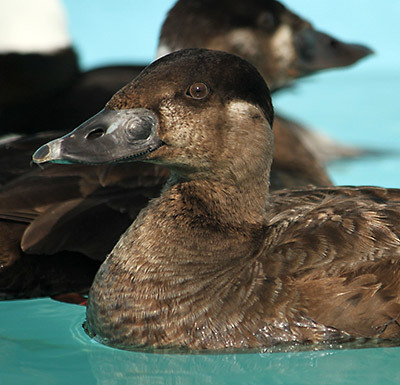 More than 160 of those birds have been cleaned and returned the wild. Without a responsible party, we funded this extraordinary response with contributions from the public – bird lovers like you, who believe wildlife needs more support than ever, and they’re right! 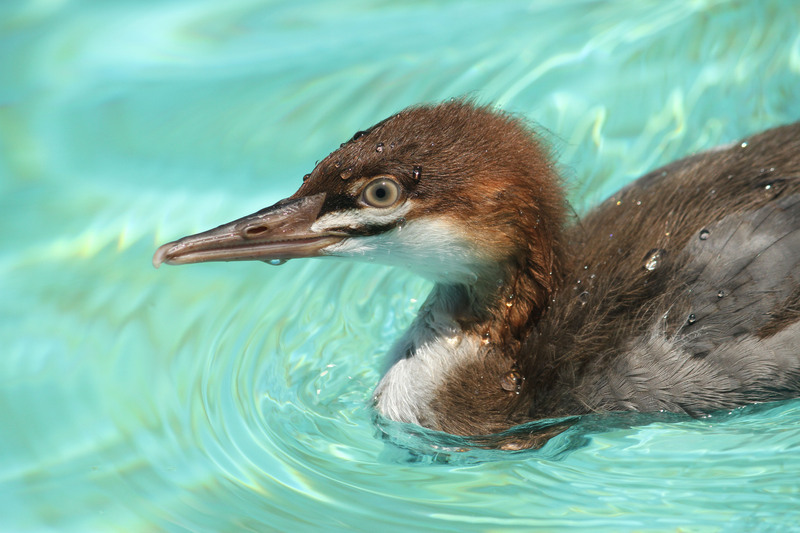 To help us continue our “Every Bird Matters” programs we are asking all our supporters to join through our Spring Membership Drive. This will insure that we have funds to meet the need of thousands of baby birds that will flood our two California centers. Our goal is $20,000 for this drive. A wonderful donor has offered to match, dollar for dollar, any donations up to $10,000! What a great way to make your donation go twice as far and help us continue to save thousands of sick, injured and orphaned birds this year! We want to encourage monthly donors too, so we have special offer provided by ALEX AND ANI and their philanthropic division, CHARITY BY DESIGN. 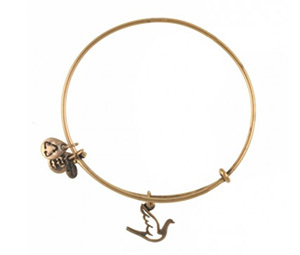 Supporters who become monthly donors will also receive the ALEX AND ANI ‘Sacred Dove’ charm bangle, a beautiful piece from the ALEX AND ANI collection. It’s a wonderful way to show your support for the birds that inspire all of us every day. And you’ll be an official member of our Seabird Circle. Your pledge of $15 a month or more as a sustaining member makes it all possible. Or, you can make a single gift by clicking here. Whatever the level, all our supporters are bird rescue heroes. We see evidence everyday that the environment is changing and we receive thousands of birds each year that are harmed by human impact, whether it is fishing line entanglement, urban encroachment or pollution. To quote our past director, Jay Holcomb, “When you stop caring for the individuals, you’ve stopped caring about the population”. Your gift is crucial to ensuring we continue to give world-class care to birds in need, including this Brown Pelican, injured by a gunshot to its wing and in care right now at our Los Angeles Center. 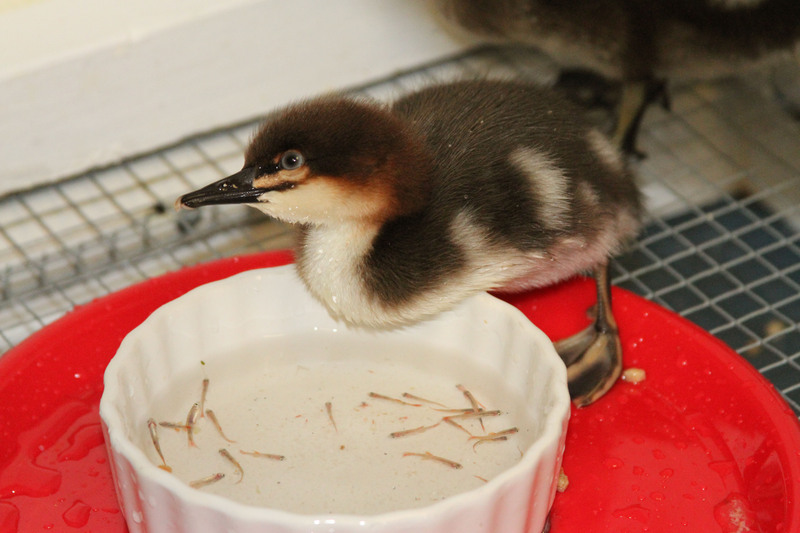 Thank you for your generosity and for helping us continue to help the birds. 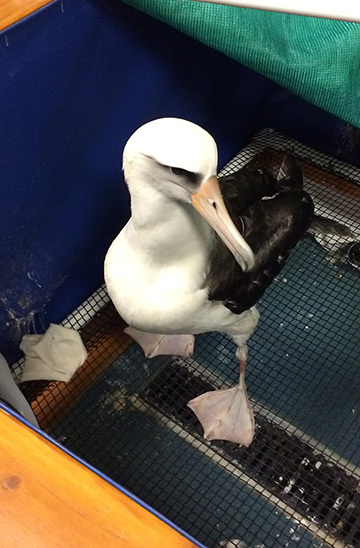 A Laysan Albatross who hitched a ride on a west coast bound container ship is now safely in care at our Los Angeles center. 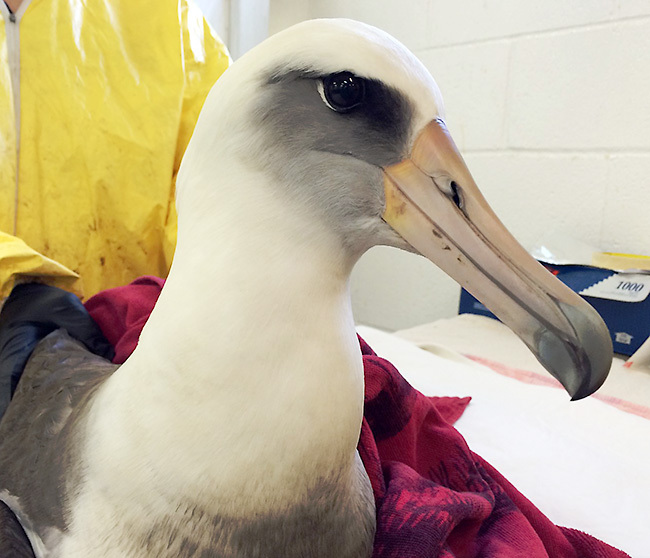 Laysan Albatross was cleaned of grease after being stuck on a container ship for at least 10 days. 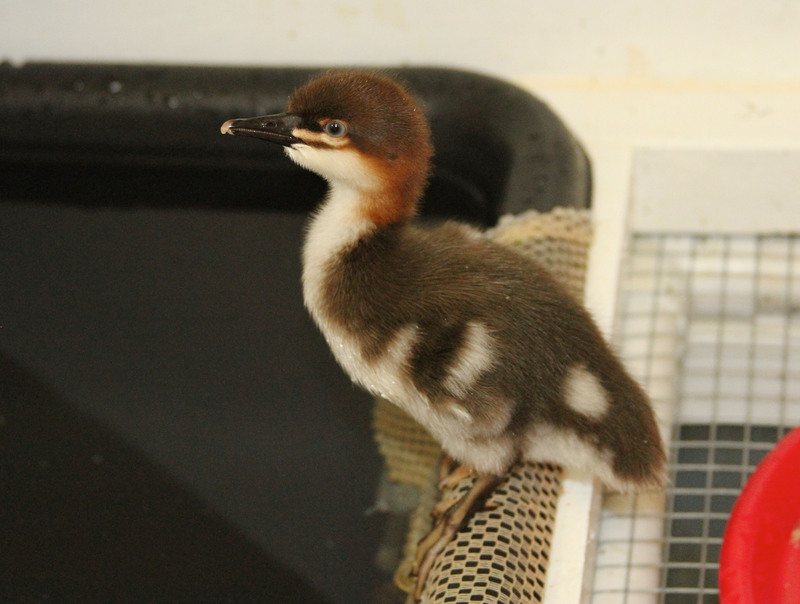 The seabird was emaciated and dehydrated when it was rescued on March 21st. It was also trapped between containers for at least 10 days on a ship enroute to the Port of Long Beach. To add to its predicament, the Albatross was also found to be contaminated by grease and had a bathtub ring of oil around its chest. 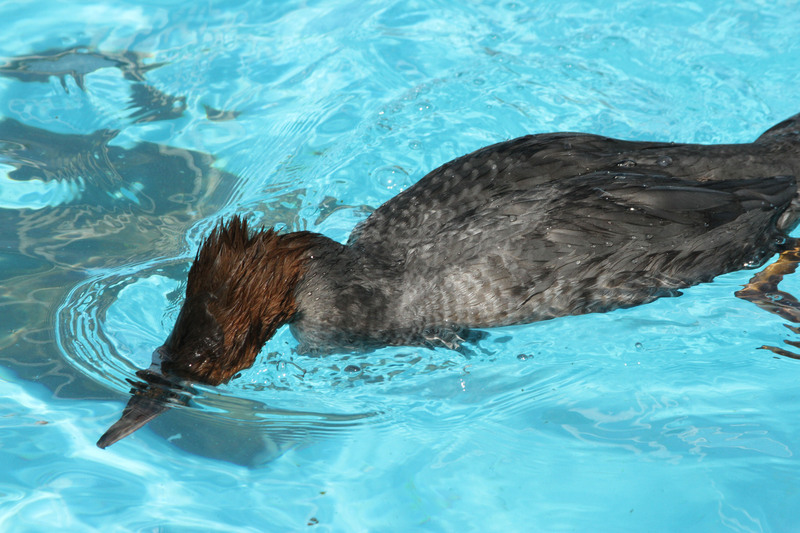 The bird was cleaned of grease at our center in San Pedro. 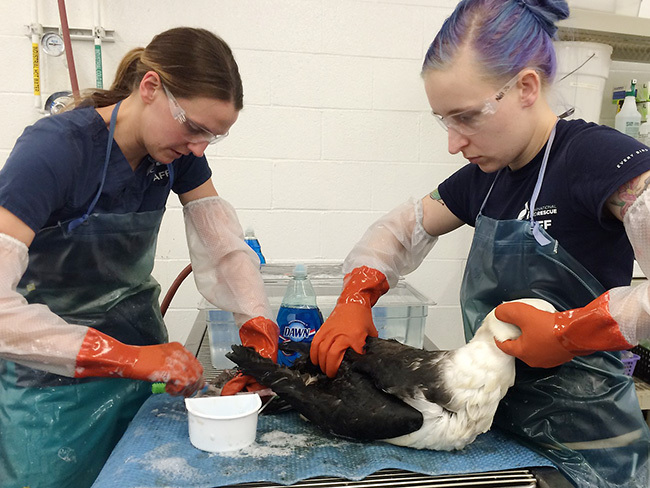 Over the last two days the bird has received supportive care (IV fluids and oral nutritional tubings). This week the bird is gaining weight and will soon be released back to the wild. Laysan Albatross are frequent stowaways on container ships that travel the ocean highways. 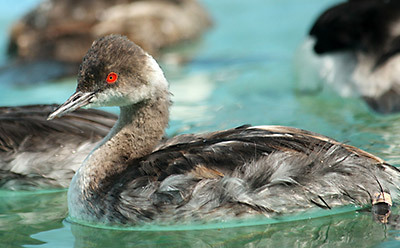 They have often been spotted resting or even building nests aboard these vessels. 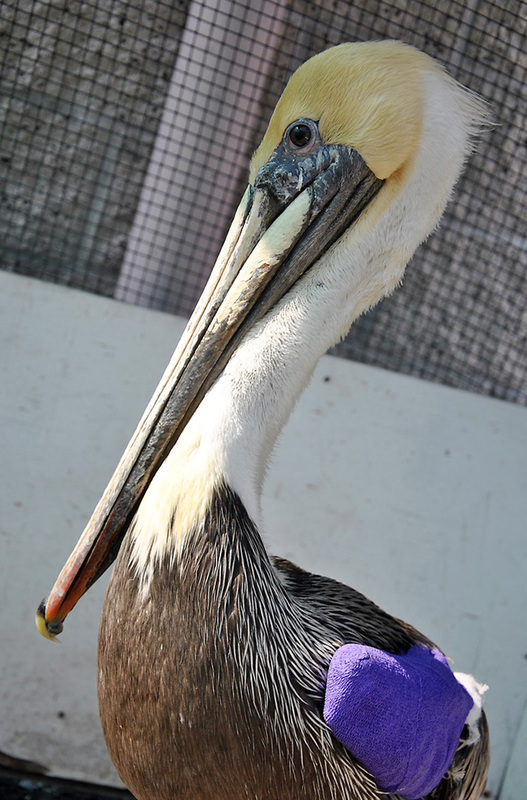 International Bird Rescue, along with help from an anonymous donor, is now offering a $5,000 reward leading to the arrest and conviction of the person responsible for shooting an adult male Brown Pelican in Southern California. 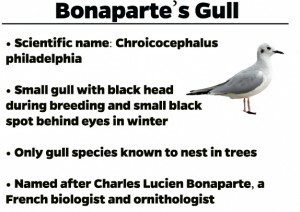 Anyone with information that might lead to the arrest and conviction of the person(s) responsible for shooting this bird should contact the U.S. Fish and Wildlife Service (USFWS) at 310-328-1516. On March 12th, a pelican that could not fly, was captured by Redondo Beach Animal Control. 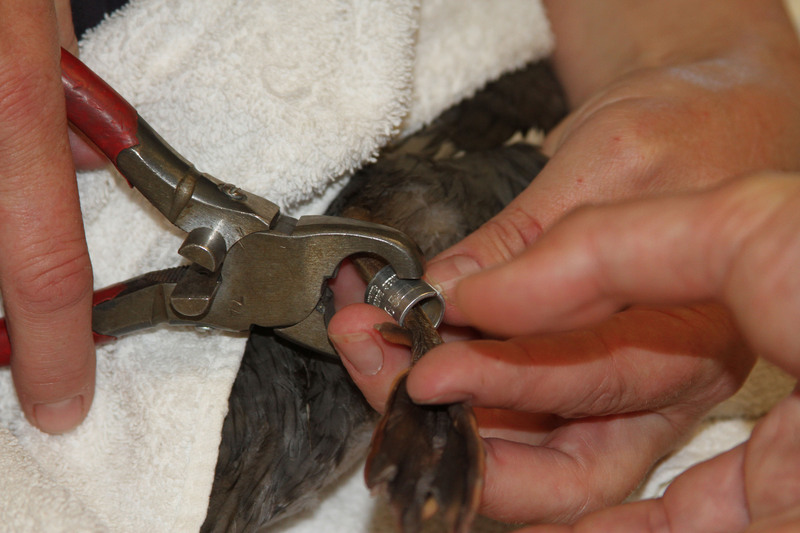 After being brought to our Los Angeles wildlife center, International Bird Rescue staff discovered he had a broken wing (ulna) and a fishhook embedded in his right shoulder. This case seemed like a straightforward fishing gear injury until clinic staff took radiographs and discovered the ulna fracture was due to a gunshot wound, as seen by the tiny speckles of metal visible in the X-ray image. The fishhook injury thankfully was superficial, but the gunshot wound was very contaminated with debris and dead tissue. A few small pieces of smashed bone that were nearly falling out of the wound needed to be removed. Our veterinarian Dr Rebecca Duerr performed surgery to pin the ulna together on March 18. The surgery went well, but the injury still carries a substantial risk of infection and this case still holds a guarded prognosis for success. 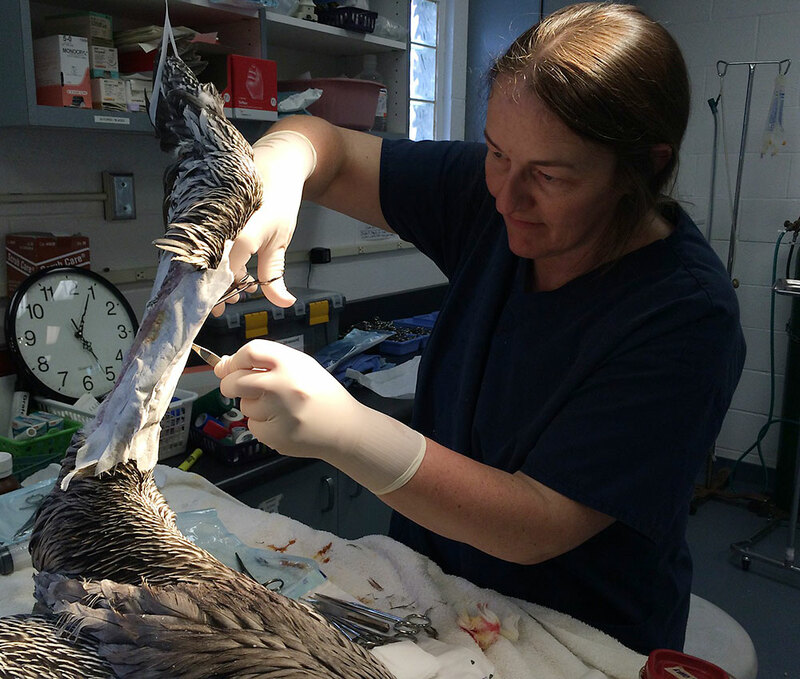 Dr Rebecca Duerr cleans and closes a gunshot wound prior to pinning the fractured pelican’s wing. 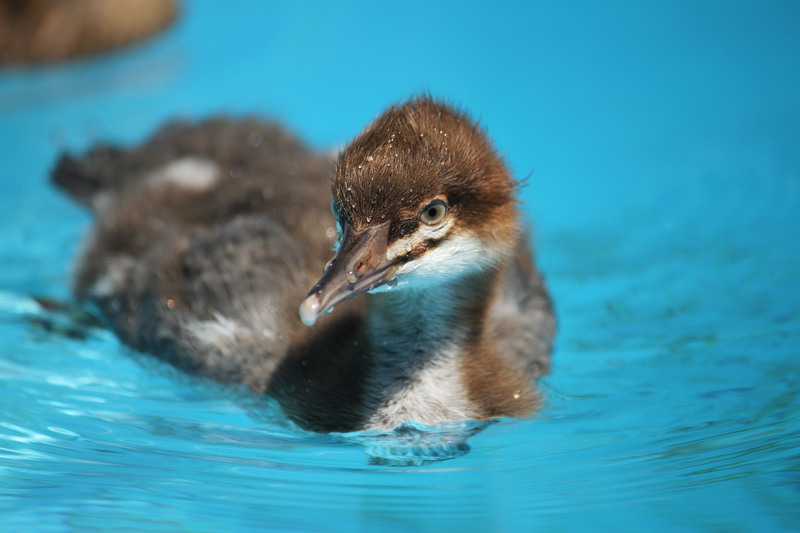 Photo by Kelly Berry – International Bird Rescue. 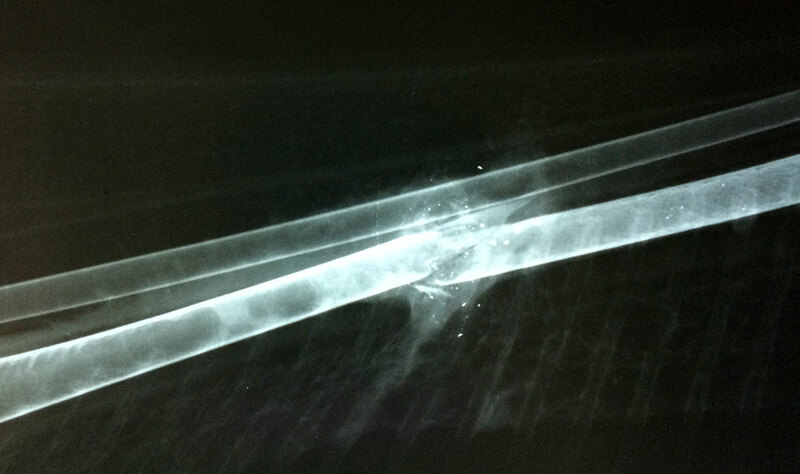 The x-ray (below) of the broken ulna show pieces of bullet. 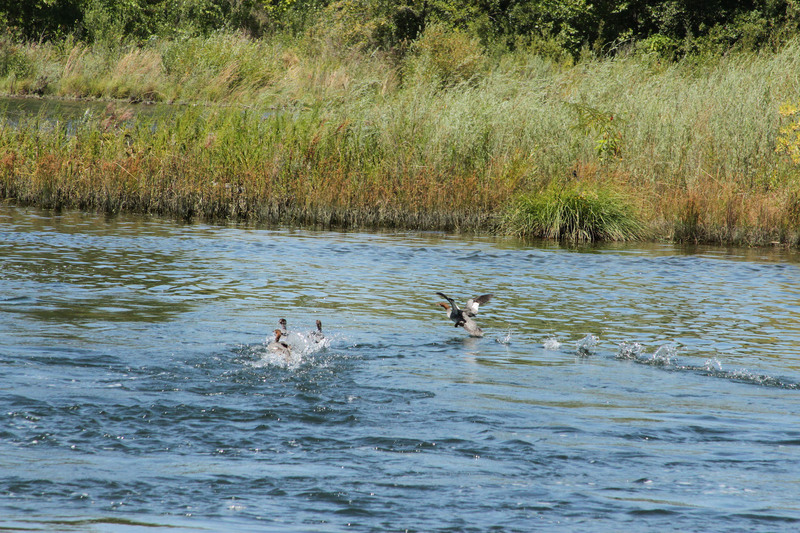 Brown Pelicans are federally protected birds under the Migratory Bird Treaty Act. As a species only recently removed from the Endangered Species List in 2009, Brown Pelicans have enough challenges in their lives without being shot. 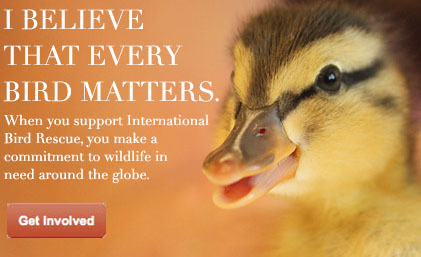 Please encourage your friends, neighbors and relatives to treat our wild avian neighbors with kindness and compassion. 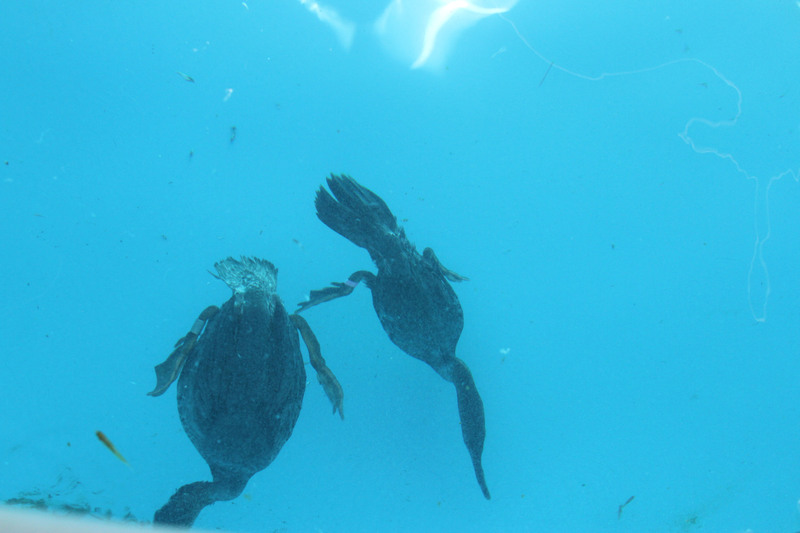 Nearly two months after 323 mystery goo seabirds arrived, International Bird Rescue is still treating the last of the bird patients affected by this unusual contaminant. 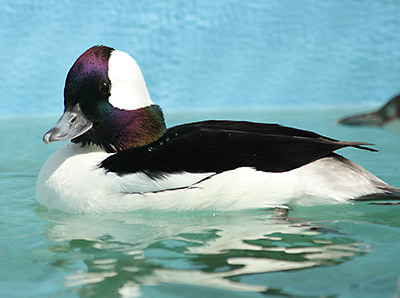 19 seabirds, including, Surf Scoters, Buffleheads and Horned Grebes are still among those in care. 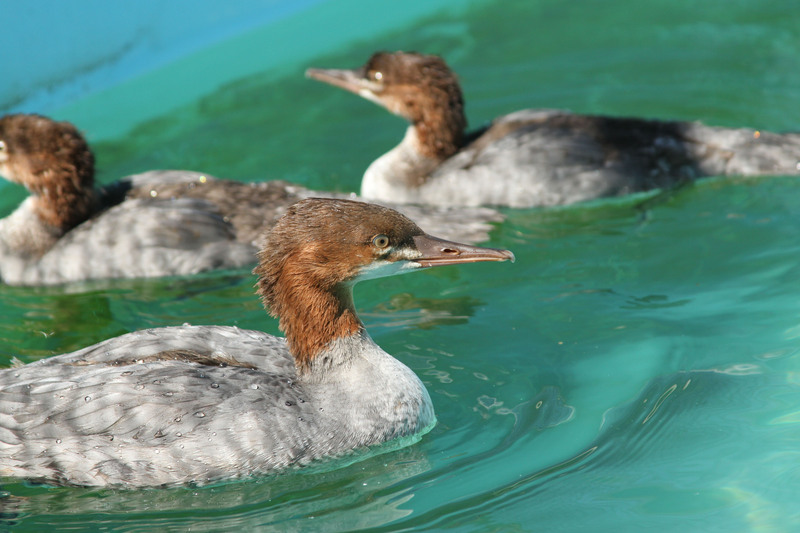 A total of 154 cleaned, healthy birds have now been returned to the wild. The birds had their feathers coated by a sticky, non-petroleum substance that grounded them along the East Bay shore of San Francisco Bay. Note: About 170 birds were collected dead by California Department of Fish and Wildlife (CDFW) personnel. The 19 birds that still remain in care are those that entered our San Francisco Bay center with serious but treatable medical problems. These included severe emaciation, anemia, or injuries. 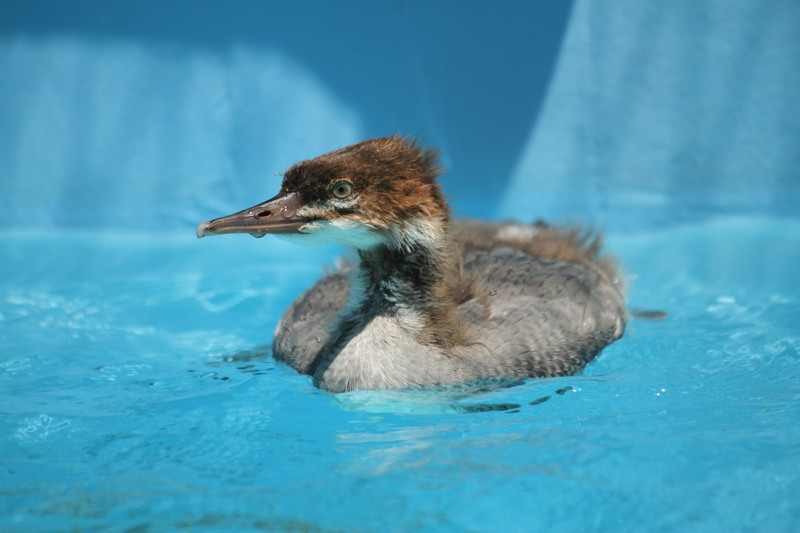 Many of these rescued birds also came to the center with pressure sores to their hocks or toes from being stranded on hard land. These injures can take months of care and healing. Other patients had surgeries for keel injuries but most of these healed quickly. 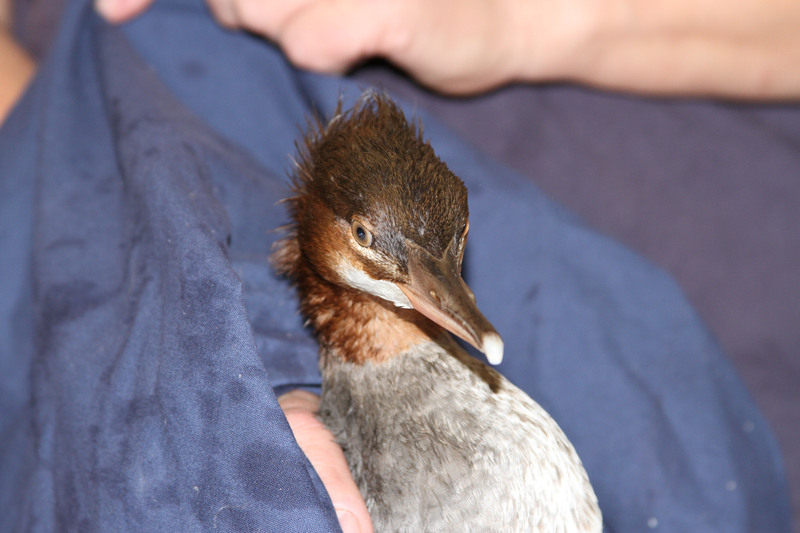 In mid-January hundreds of birds were rescued from Alameda south to Hayward in San Francisco Bay. Each was coated with an unknown tacky substance dubbed “mystery goo”. 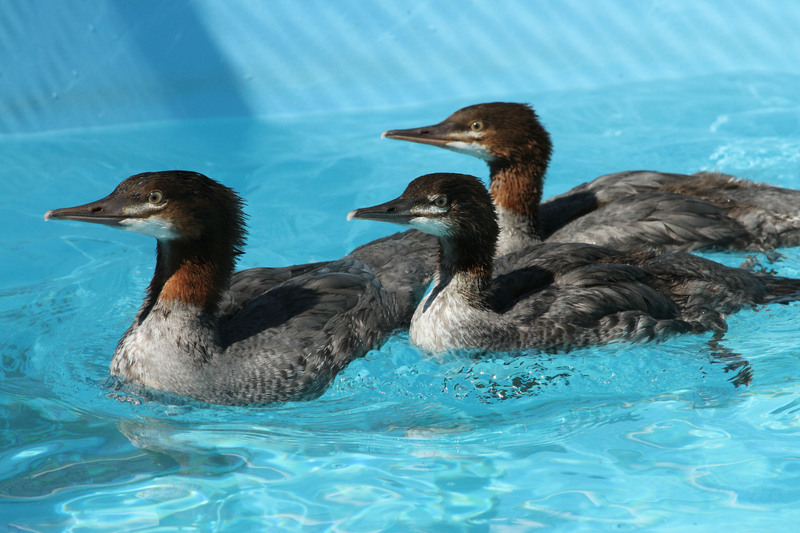 International Bird Rescue would like to thank the Ian Somerhalder Foundation, SeaWorld and Busch Gardens Conservation Fund and the Summerlee Foundation, Annie Lee Roberts Emergency Rescue Fund for their generous funding that helped to rescue and treat the hundreds of birds that were coated in “mystery goo” in the San Francisco Bay Area. The caring and concerned teams at these foundations rapidly responded to our emergency request for life-saving support. 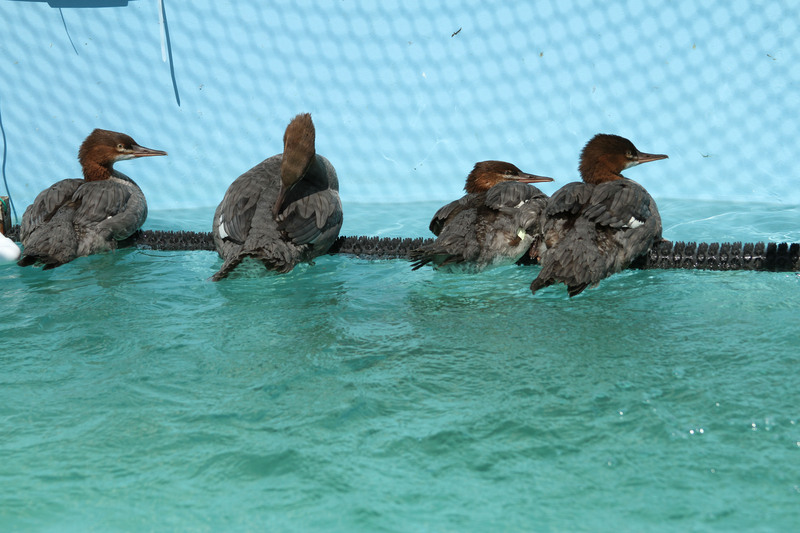 We are deeply grateful to each of them and to all of you that helped these birds get back to the wild. We couldn’t have done it without you. We recently returned a Bonaparte’s Gull to the wild after this patient was treated in the midst of the “Mystery Goo Response”. This Bonaparte’s Gull was introduced as a Patient of the Week December 6, 2014. The bird was found at Silver Oak Winery in Sonoma County, and arrived with a very large laceration exposing its thigh muscles from hip to mid leg (3 inches long on a 120 gram bird!). It also had severe damage to its right foot. The thigh wound was surgically closed. The middle toe was not salvageable and was amputated, while the outer toe had a laceration that was sutured closed, and an injury to the inner toe’s first toe joint was stabilized with a splint for two weeks. This bird’s injuries were consistent with what we have seen before in birds that have run into razor wire. After two months of treatment, the thigh laceration and foot injuries have healed very nicely and the bird grew new feathers on the new skin at the former thigh wound. 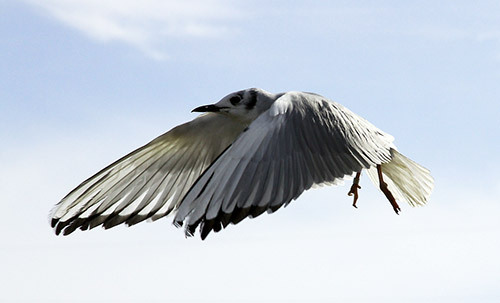 This resilient little gull spent the last few weeks flying and eating very well while growing in new feathers. 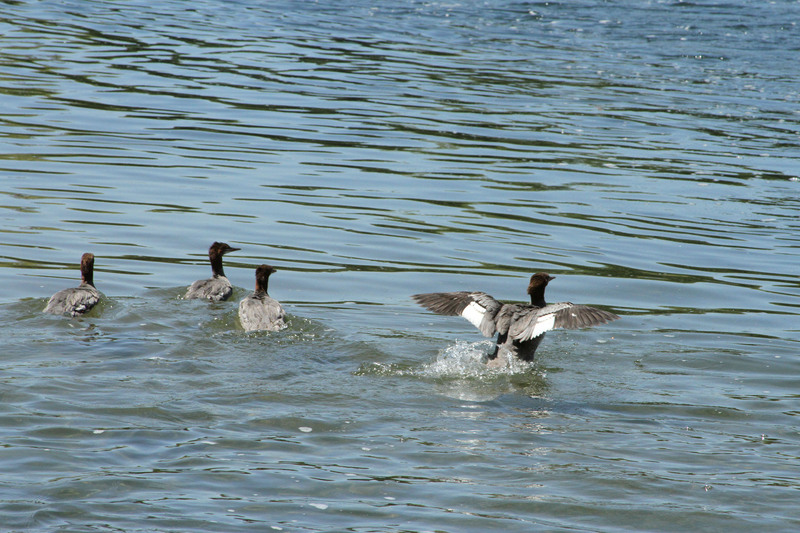 It was released last month at the Suisun Marina.